Heart defects are among the most common birth defect. In 2013 they were present in 34.3 million people. Congenital heart defects resulted in about 223,000 deaths globally in 2010 down from 278,000 deaths in 1990. ↑ Hoffman JI, Kaplan S (June 2002). "The incidence of congenital heart disease". J. Am. Coll. Cardiol. 39 (12): 1890–900. doi:10.1016/S0735-1097(02)01886-7. PMID 12084585. ↑ "What Causes Congenital Heart Defects?". National,Heart, Lung, and Blood Institute. July 1, 2011. Retrieved 10 August 2015. 1 2 Dean, SV; Lassi, ZS; Imam, AM; Bhutta, ZA (26 September 2014). "Preconception care: nutritional risks and interventions.". Reproductive health. 11 Suppl 3: S3. doi:10.1186/1742-4755-11-s3-s3. PMID 25415364. 1 2 3 Global Burden of Disease Study 2013, Collaborators (7 June 2015). "Global, regional, and national incidence, prevalence, and years lived with disability for 301 acute and chronic diseases and injuries in 188 countries, 1990–2013: a systematic analysis for the Global Burden of Disease Study 2013". Lancet (London, England). 386 (9995): 743–800. doi:10.1016/S0140-6736(15)60692-4. PMC 4561509 . PMID 26063472. ↑ "Heart Defects: Birth Defects". Merck. Retrieved 30 July 2010. ↑ "National Heart, Lung, and Blood Institute". Retrieved 30 July 2010. 1 2 Hoffman, J. (2005). Essential Cardiology: Principles and Practice. Totowa, NJ: Humana Press. p. 393. ISBN 1-58829-370-X. 1 2 3 4 Schoen, Frederick J.; Richard N., Mitchell (2010). "12. The Heart". In Kumar, Vinay; Abbas, Abul K.; Fausto, Nelson; et al. Robbins and Cotran Pathologic Basis of Disease (8th ed.). Saunders Elsevier. ISBN 978-1-4160-3121-5. ↑ Thienpont B, Mertens L, de Ravel T, et al. (November 2007). "Submicroscopic chromosomal imbalances detected by array-CGH are a frequent cause of congenital heart defects in selected patients". Eur. Heart J. 28 (22): 2778–84. doi:10.1093/eurheartj/ehl560. PMID 17384091. 1 2 3 Srivastava, D. (2006). "Making or breaking the heart: from lineage determination to morphogenesis". Cell. 126 (6): 1037–1048. doi:10.1016/j.cell.2006.09.003. PMID 16990131. ↑ Jones, Kenneth Lyons (1997). Smith's recognizable patterns of human malformation (5th ed.). W.B. Saunders. pp. 316–317, 616–617. ISBN 0-7216-6115-7. ↑ Niessen, K.; Karsan, A. (2008). "Notch Signaling in Cardiac Development". Circulation Research. 102 (10): 1169–1181. doi:10.1161/CIRCRESAHA.108.174318. PMID 18497317. ↑ Spinner, N.; Hutchinson, A.; Krantz, I.; Kamath, B.; Pagon, R.; Bird, T.; Dolan, C.; Stephens, K. (20 July 2010). 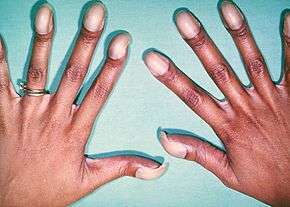 "Alagille Syndrome". GeneReviews. PMID 20301450. ↑ Tidyman, W. E.; Rauen, K. A. (2009). "The RASopathies: developmental syndromes of Ras/MAPK pathway dysregulation". Current Opinion in Genetics & Development. 19 (3): 230–6. doi:10.1016/j.gde.2009.04.001. PMC 2743116 . PMID 19467855. ↑ "Factors Contributing to Congenital Heart Disease". Lucile Packard Children’s Hospital at Stanford. Retrieved 30 July 2010. ↑ Mills JL, Troendle J, Conley MR, Carter T, Druschel CM (June 2010). "Maternal obesity and congenital heart defects: a population-based study". Am. J. Clin. Nutr. 91 (6): 1543–9. doi:10.3945/ajcn.2009.28865. PMC 2869507 . PMID 20375192. ↑ Rasmussen SA, Galuska DA (June 2010). "Prepregnancy obesity and birth defects: what's next?". Am. J. Clin. Nutr. 91 (6): 1539–40. doi:10.3945/ajcn.2010.29666. PMID 20427732. 1 2 3 4 Larsen, William J. (1993). "7. Development of the Heart". Human Embryology. Churchill Livingstone. ISBN 0-443-08724-5. ↑ Spitzer A. (1923) Arch. Pathol. Anat. 243, 81–272. ↑ Krimski L. D. (1963) Pathological anatomy of congenital heart defects and complications after their surgical treatment. M., Medicine. ↑ Thomas P. Shanley; Derek S. Wheeler; Hector R. Wong (2007). Pediatric critical care medicine: basic science and clinical evidence. Berlin: Springer. p. 666. ISBN 1-84628-463-5. ↑ "Hypoplastic Left Heart Syndrome". American Heart. Retrieved 30 July 2010. 1 2 3 "Congenital Cardiovascular Defects". American Heart. Retrieved 30 July 2010. 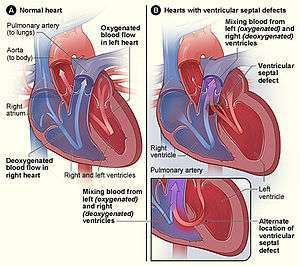 ↑ "Ventricular Septal Defect". eMedicine Health. Retrieved 30 July 2010. ↑ "Circulatory Changes at Birth". University of California at Berkeley. Retrieved 30 July 2010. ↑ "Adult Congenital Heart Association". Adult Congenital Heart Association. Retrieved 30 July 2010. ↑ Lozano, R (Dec 15, 2012). "Global and regional mortality from 235 causes of death for 20 age groups in 1990 and 2010: a systematic analysis for the Global Burden of Disease Study 2010.". Lancet. 380 (9859): 2095–128. doi:10.1016/S0140-6736(12)61728-0. PMID 23245604. ↑ "Other Names for Congenital Heart Defects". July 1, 2011. Retrieved 10 August 2015.